So many people I know are (as I mentioned in my previous post) born and blessed with beautiful, clear skin. These people are exceedingly lucky in this regard, but not so lucky in another. How are they unlucky, you ask? Well, these genetically blessed individuals are not taught to take care of their skin. They proudly announce to me that they only wash their faces with regular body soap (a huge no-no - this leads to dry skin, flakiness, and eventually wrinkles and acne! ), and make it known that they don't need skincare to have beautiful skin. The thing is, in the long run, everyone needs skincare to maintain their skin. Youthfulness, luminosity, and clarity are skin qualities that one starts to lose in his/her mid-twenties, and the only way to prevent, or at least slow down, that process, is a good skincare regimen. When should you start your skincare regimen? In my opinion, you're never too young to start looking after your skin. In your teens, start with a simple regimen consisting of a cream cleanser, a toner, a good moisturiser, and SPF. Once you hit your twenties, that's when you start incorporating the big guns in your routine. A good serum (or essence), is paramount. Serum is the superhero of skincare, because it contains the highest concentration of ingredients beneficial to your skin. Find one that absorbs easily into your skin. For example, the SK-II Facial Treatment Essence is a highly concentrated essence, containing over 90% of the brand's ingredient, Pitera. It also has a very liquid formula, which helps it absorb into the skin quickly and easily, so that it works more efficiently. Both J and I have been using the Facial Treatment Essence for a while now (2½ months for me, 1½ months for him), and we have noticed a significant improvement in clarity, smoothness, and skin tone. Your twenties are a great time to invest in a night cream. Night creams are extra effective because they work when your skin is renewing itself whilst you sleep. Get a hydrating night cream that isn't too rich, so you allow your skin to breathe. Eye creams are so important when you hit your mid-twenties, because they prevent the formation of fine lines around your eyes. 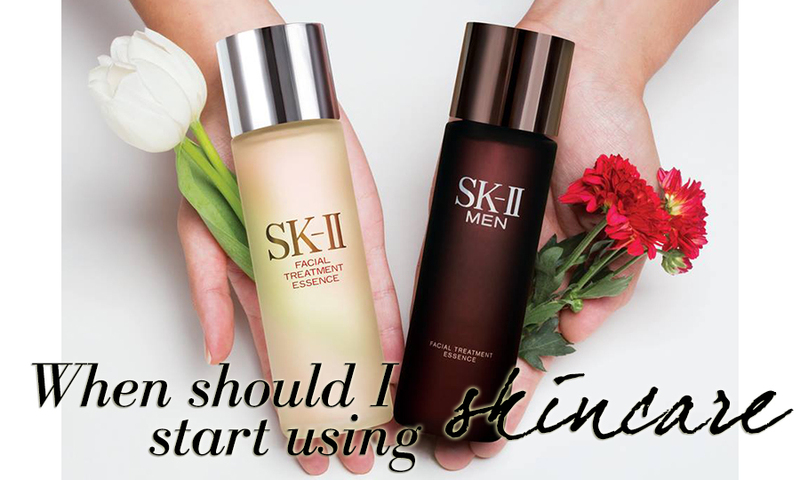 I myself am victim to these fine lines, and I have been using the SK-II Facial Treatment Essence as well as two eye creams religiously around my eyes, and have noticed a very slight reduction in the appearance of those fine lines. Phew! This is also the time to start investing in anti-ageing formulas. If you suffer from other skincare problems, like acne or oily skin, there are so many anti-ageing formulations out there that take these issues into account. Take, for example, the SK-II Stempower Essence. This skincare product not only firms your skin, it also reduces the appearance of pores caused by oily skin. Getting products like this one will help you prevent premature ageing, whilst still addressing your other skincare concerns.